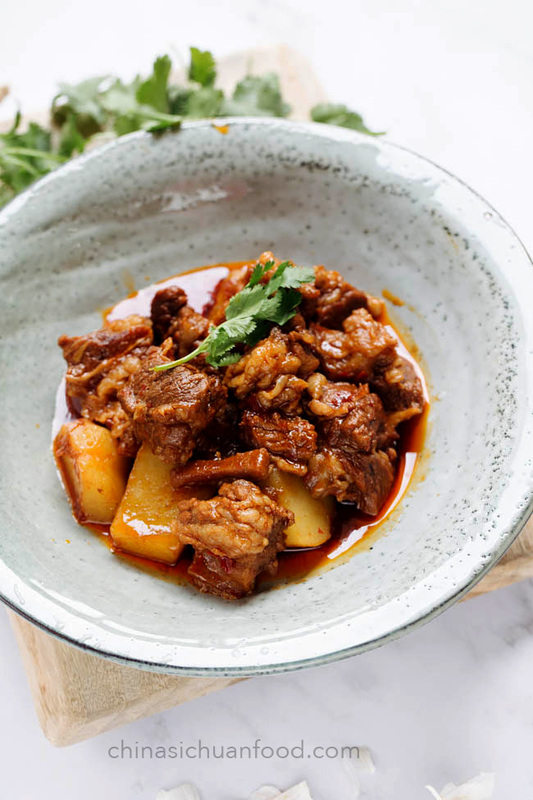 Authentic Sichuan (Szechuan) style braised beef (川味红烧牛肉)is a very humble home style dish you can meet in almost every Sichuan style restaurant. 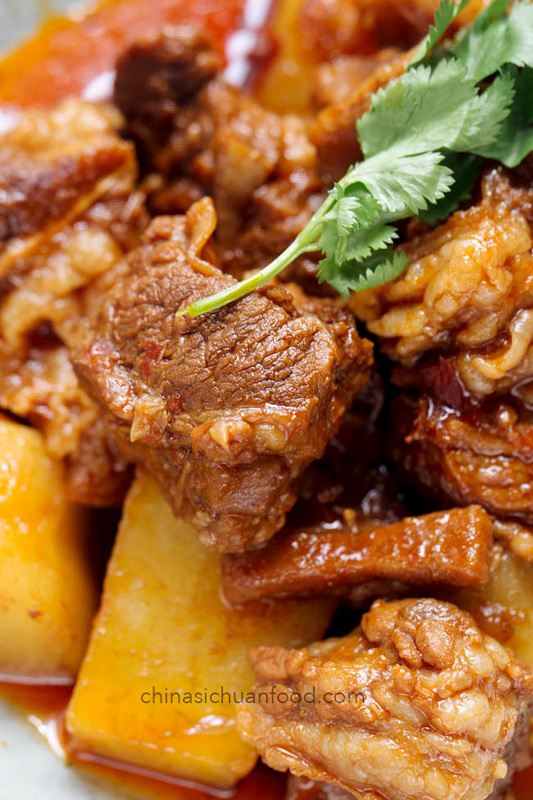 But you will be amazed how balanced and well flavored the beef cubes are and how delicious the sauce is with rice or noodles. 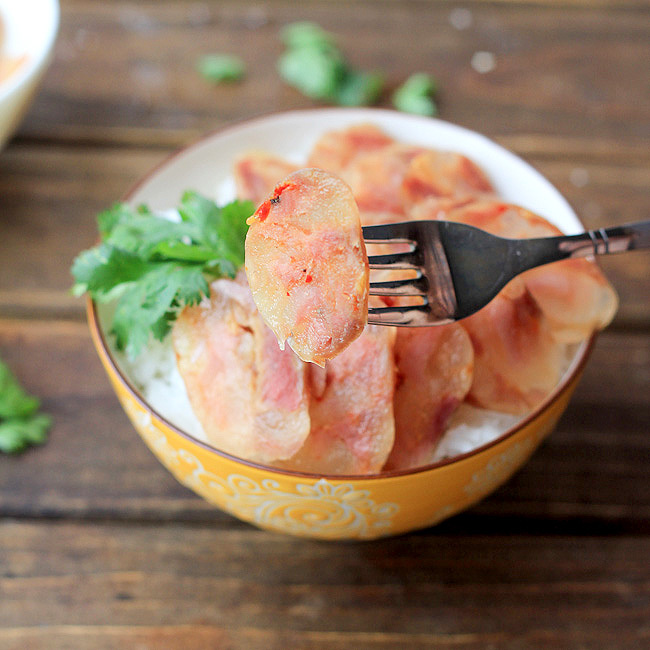 For all beginners of Sichuan cuisine, I highly comment you starting with this dish. 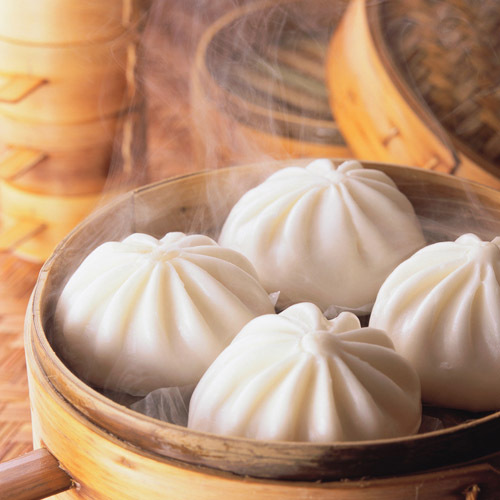 It has a very well balanced flavor, not overwhelming spicy like other new trending dishes since only doubanjiang is used for the hot taste. 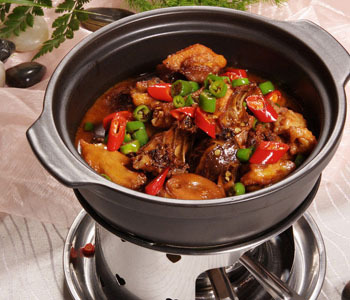 This is a traditional type of dish in Sichuan cuisine. They are also other members in this group, including twice cooked pork belly and mala chicken. 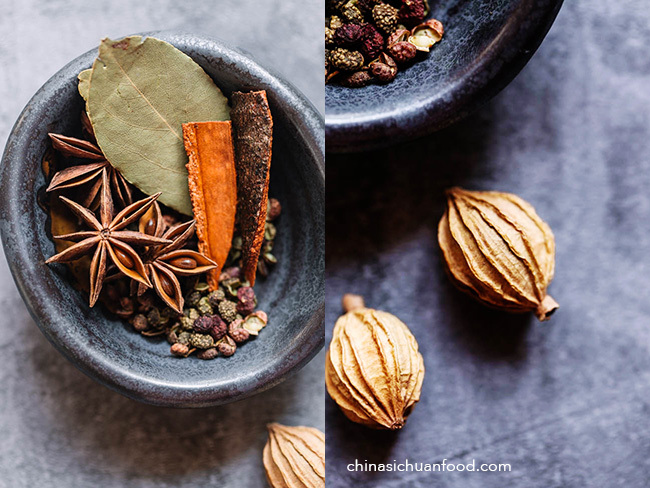 1.Spare your spices especially Chinese cinnamon (桂皮). 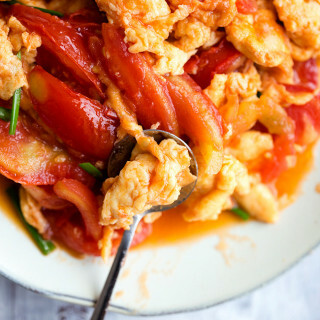 It releases a strong flavor of medicine and if used in a large amount, bring a faint bitter taste of the dish. In addition, I add two Amomum villosum Lours (砂仁) in the spicy list (shown in the right picture). I am not sure whether you can buy this outside China. But if you ever visit China or have friends, I highly recommend get yourself one bag back. 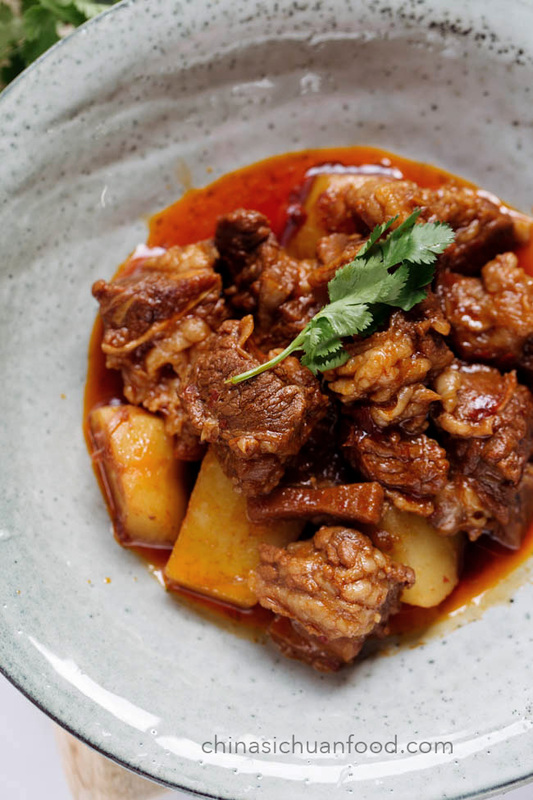 This is a very popular spicy used in Sichuan cuisine mostly for beef and lamb dishes. But it is still ok to skip if really hard to find. 2.Removing the raw taste of beef is our first step for a well flavored braised beef. This process includes two stages. The first one is to soaking beef cubes with clean water. And the second step calls for simmering for couples of minutes until the inner blood water and comes out. 3.Do not cook any vegetables along with the beef. 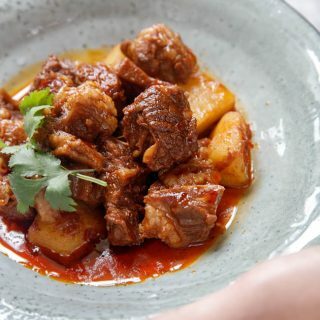 In lots of other beef stew recipes, some of the best partners like carrot, tomato, potatoes and onions are cooked along with the beef to create a multilayer of tastes. 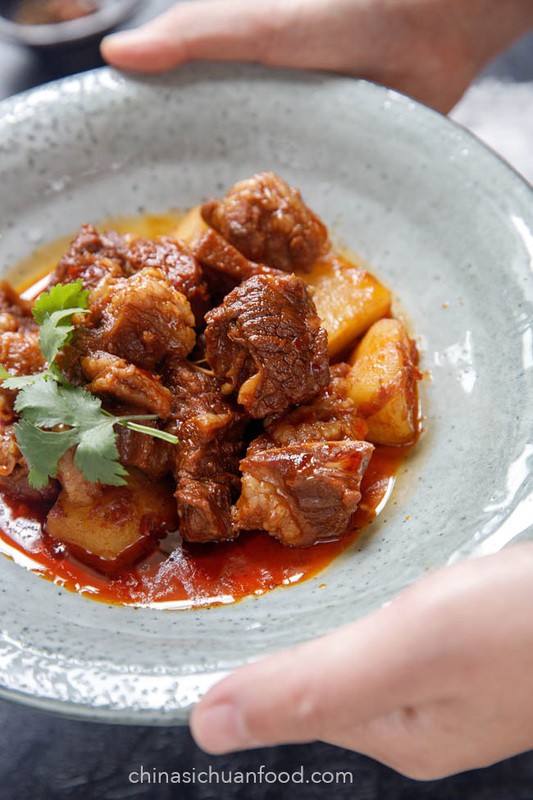 But they do influence the taste of the beef cubes, more actually weaken the original flavors and add some new, either vegetable sweet or etc. 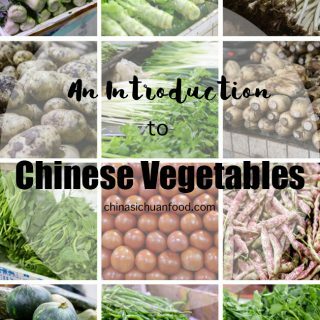 Cook vegetable in another pot and mix them together after the beef is already well cooked. 4. By the way, coriander is the best partner of braised beef. Add them before serving. 5. How to deal with ginger. 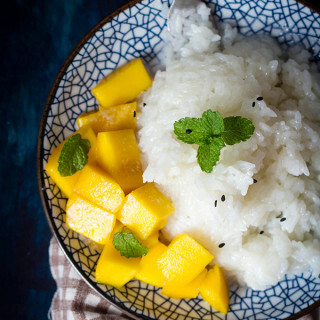 We will ginger in two process of this recipes. Slice 3 to 4 pieces off and we will use this one in the blanching process and then pat the remaining and that’s the common Chinese way of getting ginger juicy releasing in the soup. Cut the beef sirloin into small chunks and then soak in a large pot of clear water for half an hour. Get a large pot and load it with enough water, add 2 slices of ginger and 1 tablespoon of cooking wine. Place the beef in cold water, start the fire and bring everything to boil for 2 minutes. Transfer out and drain. 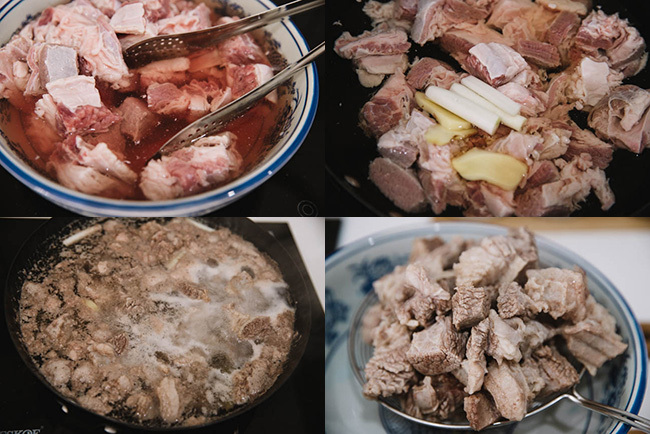 Add around 1 tablespoon of cooking oil in your pot and fry doubanjiang until the oil turns red too (This is the most important step to make the doubanjiang aromatic, be patient). Place leek onion, garlic, ginger and other spices, fry over small fire until aromatic (do not over cook spices for avoid any bitter taste). Place the beef in and fry for a while until you can smell the aroma of the beef. Add rock sugar, light soy sauce and dark soy sauce. Continue frying for couple of minutes so the flavors can be well combined. Then place water or beer to cover the beef (3cm higher in regular pot) or 1.5 cm higher in high pressure cooker. Cook until the beef is well softened. 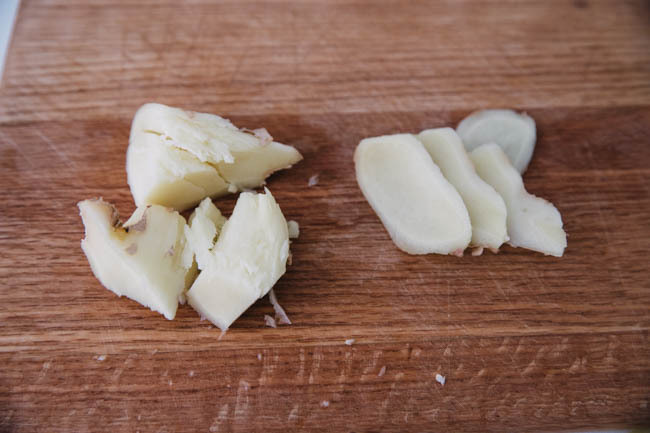 Peel the cut the potatoes into 3 cm cubes and then cook the potatoes with clean water for 20 minutes until almost soft. Drain the potatoes and add then into the well cooked beef. Mix in and continue cook for 2 minutes. Cover the lid and let them combine well in the pot. 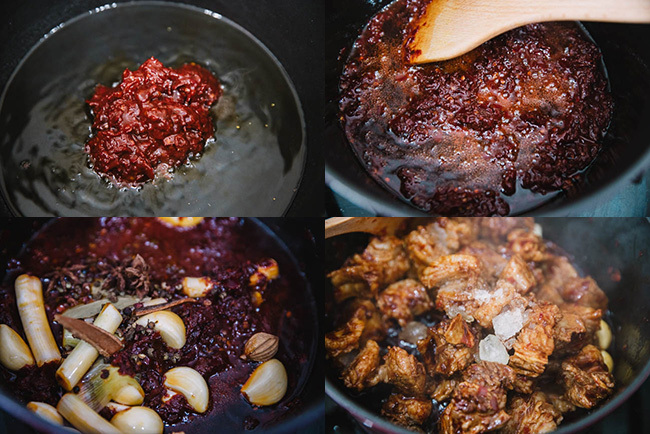 Add around 1 tablespoon of cooking oil in your pot and fry doubanjiang until the oil turns red too. Place leek onion, garlic and ginger and other spices, fry over small fire until aromatic. Place the beef in and fry for a while until you can smell the aroma of the beef. Add rock sugar, light soy sauce and dark soy sauce. 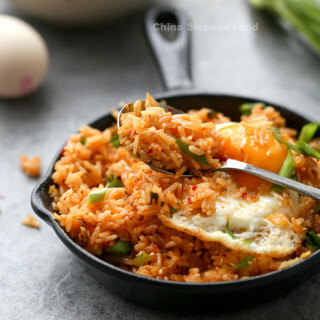 Continue frying for couple of minutes so the flavors can be well combined. Then place water or beer to cover the beef (3cm higher in stove pot and 1.5 cm higher in high pressure cooker) and then cook the beef until well softened. I almost drooled on my keyboard when reading this recipe 🙂 I do have some questions though. By “one” garlic do you mean one bulb or one clove? The pictures suggest the first one, I just want to make sure, as that is surely a lot (not that I mind). 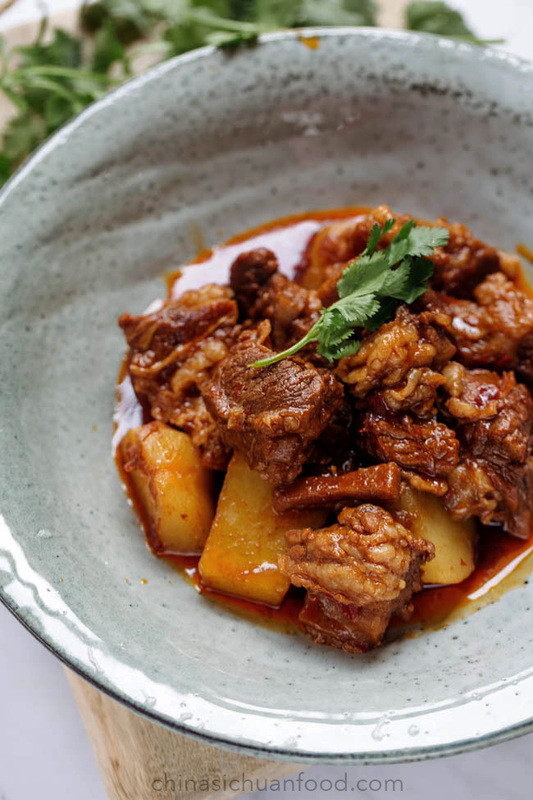 I’m surprised ginger is only used for precooking the meat and not in the final dish – having read a lot of your recipes that seems rather uncommon. 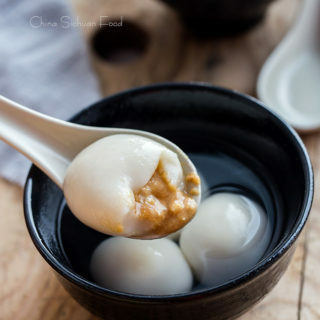 Does the 砂仁 maybe taste similar? Should I add a little bit of ginger if I can’t get it? 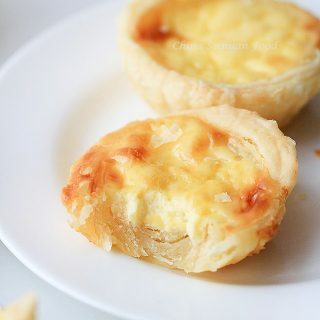 And lastly, what kind of side dishes ie salad, vegetables, soup would you serve this with? 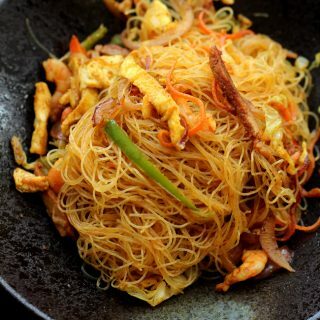 Do you serve this with rice or noodles? Sorry for so many questions, but I can’t wait to try this out. By the way, the word “meat” seems to be misplaced in the very first sentence. I just don’t know if this should be “meet” or “eat”. Hi and thanks for reading the post so carefully. Actually I use ginger in both the blanching process and the final dish. I have add that part. For the garlic, I mean one bulb with whole pieces. They will one of the best part in this dish. 砂仁 brings a unique flavor, but not very strong. If you cannot get it, other seasonings can produce a decent flavor. No need to use more ginger. And the last one is a typo. It should be “meet”. Thanks so much for your correction. 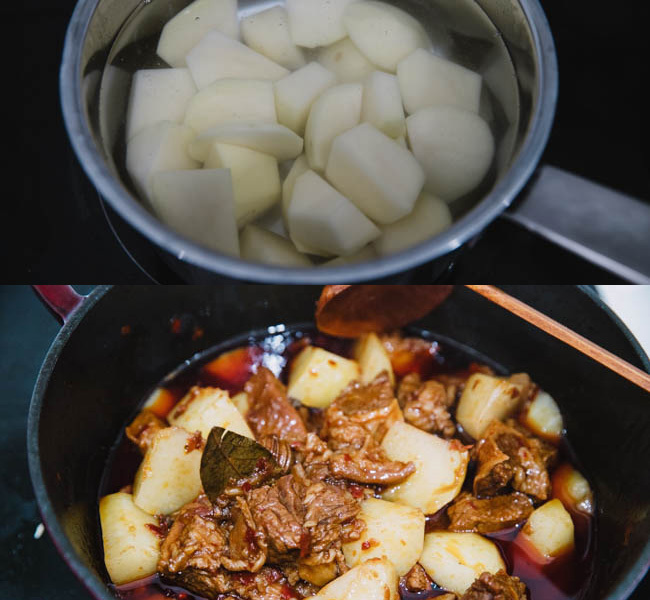 By the way, it is a large pot of beef with potatoes, so I usually serve it with steamed rice, a side dish, a vegetable stir-frying or salad and make a very simple soup. That’s a very common meal in my family.